This book is based on letters sent during the war by Robert (Robin) D’Arblay Gybbon-Moneypenny and his younger brother Phillips Burnley Sterndale Gybbon-Moneypenny, to their Aunt Ethel, who lovingly kept them. In addition Robin wrote his own memoirs in later years, and this forms the bulk of the text. Robin’s letters generally consist of his requests for clothing and supplies – for himself and his men – an interesting insight into the evolving and ongoing needs of the soldier in the trenches (for example requesting opium pills to give to wounded soldiers), as well as a testament to the concern officers had towards the welfare of their men. Although mindful of the level of information being given, both brothers’ letters do provide quite a lot of detail about life in the trenches, including several near misses and sometimes quite grisly accounts of comrades’ deaths – hardly the reassurance a worried relative was looking for. Robin’s memoir also contains some quite graphic recollections, including the struggles of hand-to-hand combat and descriptions of the effect of shellfire on the body. The experience of being shelled crops up several times during Robin’s account. He had a couple of lucky escapes when shelled, and in one barrage was buried three times. He recalls vividly the effect of shelling on his nerves, so it hardly surprising that the impact of artillery is a common thread in his account. He also describes other encounters of note, for example the impact of the first German gas attack, when his battalion was rushed into support to try and curb the German breakthrough. Through his recollections a sense of the panic this caused can be gauged, although at the time he played it down in his letters home. Robin was wounded on several occasions – the last time a serious chest wound from a shell fragment – but was always anxious to return to his battalion. His account continues to offer interesting nuggets of detail, such as the satisfaction at hearing a ‘tremendous’ British bombardment rather than German, and the feeling of security when steel helmets were issued. In addition to the text, the book contains several of Robin’s photos, taken with a Kodak camera during the early part of the war until he was forced to send the camera home. These depict various aspects of trench life, and are a fascinating complement to his letters. Robin’s brother Phillips joined the Royal West Kents in April 1916 and arrived in France during the 1916 Somme campaign. He was recommended for the Military Cross twice, including for one attack where he bayoneted four Germans, an event he refers to candidly in a letter home, even stating that two of them were surrendering. He was eventually awarded an MC, before being killed in action in June 1918, his last letter home a poignant inclusion in the book. With two brothers’ wars to follow the book at times feels disjointed, and the usual caveats around accounts written many years after the war must be borne in mind (particularly the several ‘verbatim’ recollections of some conversations). 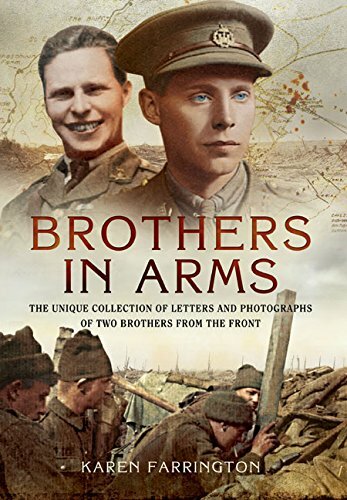 However, the letters offer a real contemporary insight into how these two young men perceived and experienced the war, and the memoir is one of the most vivid and insightful I have read in recent times.